In 2011, the International Union for the Conservation of Nature (IUCN) declared the Africa's western black rhino extinct. All that remained of it were photographs and stories that begun ‘once upon a time’. According to IUCN, by the end of 2015, the number of African rhinos killed by poachers had increased for the sixth year in a row with at least 1,338 rhinos killed by poachers across Africa in 2015. That, in an unfortunate case of déjà vu, is the same script that elephants and pangolins are following. Between 2010 and 2012 an estimated 100,000 elephants were killed for their ivory, a result majorly attributed to a spike in ivory prices in Asia of over USD 2,000 per kilo. Between 2009 and 2015, an estimated 188,170 kg of ivory was reportedly smuggled through Kenya’s Port of Mombasa. It is estimated that 100,000 pangolins are killed every year for their meat and scales for the Chinese and Thai markets. In July 2015, the first class of dogs graduated from the African Wildlife Foundation’s (AWF) Canine for Conservation Programme, a unique anti-trafficking program funded by the Department of State, International Narcotics and Law Enforcement (INL) and AWF. The program specifically combats the “trafficking” component of the illegal wildlife trade by installing ivory detection dogs at seaports, airports, and other trafficking chokepoints, and aims to establish a “canine center of excellence” on the continent. 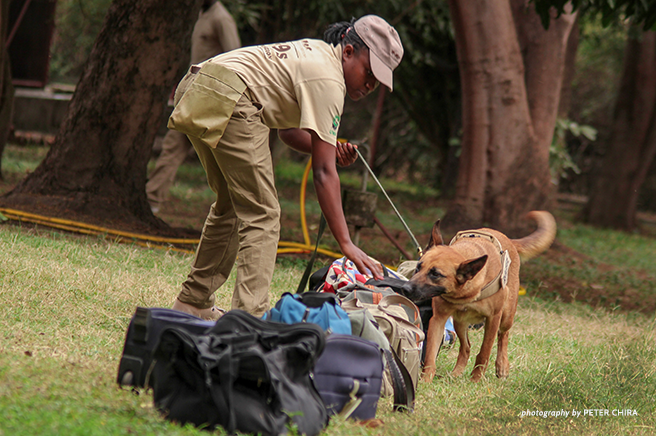 The eight dogs are currently stationed in airports and seaports in Kenya and Tanzania, working closely with the wildlife authorities to diligently detect wildlife products bound for international travel. By the end of May 2016, the Canine Unit at Jomo Kenyatta International Airport (JKIA) had made 27 finds representing half of the finds at JKIA in the last seven years. On the 30th of March 2016, the Canine Unit intercepted 18 pieces of raw ivory worth KES 6.4 million (USD 63,136) in transit from Maputo to Bangkok which was concealed in gunny bags wrapped in nylon and put in buckets. In June, the Kenya Wildlife Society (KWS) intercepted 500kgs of pangolin scales at JKIA from Conakry, Guinea to Laos in Asia. A similar amount from Kinshasa to Bangkok was netted at the airport in March. These interceptions have proved that these highly trained dogs can detect even the smallest amounts of wildlife contraband, like ivory or rhino horn dust, and they boast a 90 percent accuracy rate. On 15 August 2016, Uganda joined Kenya and Tanzania in their efforts to curb illegal wildlife crime and in particular ivory trafficking through its borders and also within the boundaries when four dogs graduated during the second class of the Canine for Conservation programme. The dogs will be deployed at Entebbe Airport to seal off that route which smugglers have been utilizing and disguising ivory without being detected. “In the last five years, Uganda has experienced increased trafficking of wildlife products through its boundaries and unfortunately the enforcement units were not able to detect most of the contrabands in transit. This move by Uganda to deploy these highly trained canine dogs is a significant milestone in Uganda’s effort to curtail illegal wildlife trafficking,” said Dr. Andrew Seguya the Executive Director Uganda Wildlife Authority (UWA). The 12 handlers and their dogs will form the pioneer canine section at UWA which has come at a time when Uganda is faced with a significant challenge of ivory trafficking. According to Dr. Seguya, the deployment of the dogs at Entebbe Airport and other hot spot trafficking routes will, therefore, make it difficult for traffickers to use Uganda as a smuggling route for ivory and other wildlife contraband. Wildlife poaching and the illicit trade of wildlife and products continue to plague the region, and if not addressed authoritatively and with cohesion, it will have severe economic and biodiversity consequences. In East Africa, wildlife tourism attracts more than three million tourists per year, generates a large percentage of GDP in the national economies, while directly employing more two million citizens in the region.